We've all heard the sayings "girls will be girls" or "boys will be boys" when it comes to kids. They just do silly little things that only a boy or a girl would do. Having both girls and one boy I get the best of two worlds as a mom. There are moments of cars, races and robots with my little guy and moments of makeovers, secret telling and fashion shows with my oldest daughter. In light of both worlds, Kinder Canada is celebrating with a whole new set of Kinder eggs - for boys and girls! One of our daughters favourite blue eyed, pink wearing dolls is featured in new Kinder Surprise just for girls. Can you guess who she is? Barbie! Yes, even the Kinder Surprise wrapper is tinted pink for these fun new Barbie Kinder Surprise treats! There are fun Barbie themed toys for your little princess to collect like rings, bracelets, Barbie figurines and more! Wait a minute? What about the boys? Don't worry, Kinder Canada did not forget about our little guys and have special Hot Wheels Kinder Surprise just for them! One in three Kinder Surprise contains a Hot Wheels car toy for your little guy to enjoy! Look for specially marked packages wherever Kinder Surprise are sold! Being a #KinderMom rocks! 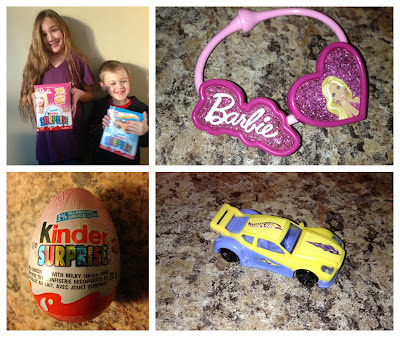 We were fortunate enough to get our hands on a box of each the Barbie Kinder Surprise and the Hot Wheels Kinder Surprise. The kids were so excited when we handed them each a box. Upon opening their first eggs, the kids each got a Barbie and Hot Wheels toy! What are the odds of THAT happening! My daughter is now determined to collect ALL of the Barbie toys from Kinder Surprise. She really likes the jewelry especially since she gets to put it together! My son loves anything to do with race cars and of course Hot Wheels is already one of his favourites, he was thrilled to see them in Kinder Surprise. I think hubby liked the Hot Wheels ones as much too. I think having Barbie and Hot Wheels involved with Kinder Surprise is a fun treat for everyone. It's fun to have a familiar toy inside an already loved milk chocolate treat. It makes Kinder Surprise all the more special for those moments of joy with the whole family. To kick off the launch of the new Kinder Barbie and Hot Wheels, Kinder Canada will be having a contest giving away 40 Kinder Barbie Hot Wheels prize packs including Barbie and Hot Wheels toys and a box of 24 Kinder Surprise eggs. This contest is exclusive to Facebook fans! Starting January 10th for four weeks, you can participate simply by liking the Kinder Canada Facebook page and following the instructions how to enter for your chance to win! Good luck! Show Kinder Canada some love also by following them on twitter @KinderCanada and follow us KinderMom's using hashtag #KinderMom and see what everyone else has to say about the new Kinder Barbie & HotWheels! Awww! Sweet post! So much fun! We have only one girl. One of each would be nice!